04/07/09: J7 publish a revised, updated and expanded list of nine possible Alternative Hypotheses. Ten months after the events of 7 July 2005, on 11 May 2006, the Home Office published the 'Report of the Official Account of the Bombings in London on 7th July' (here-in referred to as the Official Report). The Official Report has since been discredited owing to a factual inaccuracy, namely the departure time of the train the accused are alleged to have taken from Luton to Kings Cross. This error was announced to Parliament by the Home Secretary on 11 July 2006. The Official Report was designed to replace a full and independent public inquiry, yet has already been proven to be inaccurate. Furthermore, additional errors in the report have also been acknowledged, again with regard to key aspects of the statements made. Mind the Gaps Part 1 and 2 endeavour to highlight some of the many anomalies, inconsistencies and outright errors in both the official report and media coverage of the events of 7/7. "Police denied that they had recovered any unexploded devices. But a source told The Guardian that three controlled explosions had been carried out on "suspect devices". Furthermore Vincent Cannistraro, the former head of the CIA's counter-terrorism centre, told The Guardian that "two unexploded bombs" were recovered as well as "mechanical timing devices". "Al Qaida employed light but advanced bombs detonated by timers in last week's bloody strike on London's mass transit system. British officials said authorities have determined that the four bombs that blew up in subways and a bus in London on July 7 were composed of less than 4.5 kilograms of explosives each. They said the bombs were small enough to fit in a knapsack and were detonated by timers rather than suicide attackers." The NYPD stated that they believed the timing devices had involved the use of mobile phones. Interestingly, the NYPD was criticized for making an "erroneous statement" regarding the information they released regarding the explosives used and the method of their detonation - which implies that the information they released was wrong. However, the only error they made was suggesting that Scotland Yard had given them clearance to state their findings, which it had not. Scotland Yard refused to comment on the NYPDs findings. On July 16th, The Mirror ran a cover story questioning the ‘suicide bomber’ theory. Other media also questioned it, since this theory is constantly implied and has been generally assumed to be the correct one, but has never actually been stated categorically by the authorities. By August 24th, it was apparently confirmed that remote detonators had not been used. Instead, senior police sources told reporters that the bombs had been triggered by the pressing of a device similar to a button. "The news that the bomb attacks were carried out with button-like devices triggering the bombs was confirmed to the Guardian by several separate senior police and counter-terrorism sources. "There were no mobile phone timers on the seventh," one source said. "They were manually activated". "I noticed him reaching into his bag and he didn't say or do anything. He wasn't agitated or fidgety, he was very calm. He looked at me and looked around the carriage. Then he pulled some sort of cord." However, Mr. Biddle’s account has not been consistently reported, as mentioned previously. That the detonation was caused by something being ‘pulled’ rather than ‘pressed’ was also suggested by the testimony of bus bomb survivor, Louise Barry, who was found to have the detonation device embedded in her leg. The device was described as a ‘toggle’. “TARA BROWN: Do you know what role the toggle played in the bomb itself? "Witness accounts suggest 2 of the men were fiddling in their rucksacks shortly before the explosions." Despite the fact that one of these was Richard Jones, who obviously did not see Hasib Hussain at all, and the only other witness on public record who made a similar statement, also gave conflicting accounts. The narrative also cites Hussain’s ‘appearance’ of buying a battery that morning as further evidence that remote detonators were not used, when the narrative cannot say for sure whether he did actually buy a battery or not. The narrative states that there was no evidence at the bomb sites of remote detonation, which obviously conflicts with the reports above from the authorities who supposedly saw them. Surely, by the time the narrative was complete it should have been confirmed exactly how the bombs were detonated and not leave the narrative itself to employ speculation based on quite flimsy evidence. "Technical data and witness accounts suggest the bombs contained synchronized timing devices and were probably not triggered by suicide bombers, police said, adding that the bombs were composed of "high explosives" and probably not homemade material." Christophe Chaboud, head of the French Anti-Terrorism Co-ordination Unit, was also reported to have said a day later that the explosives used were "military in origin". He also mentioned that they were possibly trafficked from the Balkans, since it would generally be quite difficult to obtain military explosives, unless the men had "someone on the inside" to get them out of the military establishment. "Superintendent Christophe Chaboud, head of the French security service’s Anti-terrorist Co-ordination Unit, said: “The use of military explosives is very worrying. We are more used to seeing home-made explosives made from chemicals. How did they procure them?" "French Interior Minister Nicolas Sarkozy told the emergency meeting of EU justice ministers in Brussels that there was strong suspicion the explosives used in the bombings came from the Balkans or Eastern Europe, where it is possible to buy the material on the black market after the Balkan wars." "Traces of military plastic explosive, more deadly and efficient than commercial varieties, are understood to have been found in the debris of the wrecked Underground carriages and the bus. Scotland Yard has asked its counterparts around Europe to check stockpiles at military bases and building sites for missing explosives." "All we are saying is that it is high explosives. That would tend to suggest that it is not home-made explosive. Whether it is military explosive, whether it is commercial explosive, whether it is plastic explosive we do not want to say at this stage." "Traces of the explosive known as C4 were found at all four blast sites, and The Times of London said Scotland Yard considers it vital to determine if they were part of a terrorist stockpile." "Immediately after the blasts detectives found traces of RDX explosive, a key component used in the Madrid train bombings." By mid-July, however, when police reported that they had found traces of explosives in a flat in Leeds, there was no more mention of "high grade" or "military explosives". The Independent reported that police had found a "bath filled with explosives" in the flat in Alexandra Grove in Burley, although other reports much less sensationally told of the police finding "traces of explosives" in the flat. "TATP is widely considered to be too unstable to synthesize safely in standard laboratory facilities, though small quantities (under 1 gram) are occasionally synthesized for research purposes, and for testing and calibration of detection equipment." Which makes it seem rather unlikely that TATP could be produced in quantities that would fill a bath, and then driven a substantial distance in a car before being carried around in a rucksack – especially as one a representative of the Metropolitan Police Anti-Terrorist Branch claimed one of the men was on CCTV "going into shops and bumping into people". "British investigators said they found two unexploded bombs made from peroxide-based HMTP, and encased in nails in a car the attackers left at the Luton train station north of the capital. They did not immediately specify how they knew the bombs that exploded aboard three London subways and a bus were made from peroxide-based explosives, which must be kept cool until used." "In an unusually detailed briefing, officials from the NYPD's large anti-terrorism department, said that the bombs used a peroxide-based explosive called HMDT, or hexamethylene triperoxide diamine. HMDT can be mixed from mundane ingredients such as hydrogen peroxide (hair bleach). The only unusual piece of equipment the bomb-maker needed to produce large quantities of HMDT was a commercial refrigerator, because the explosive degrades if it is left at room temperature. Yesterday, NYPD officials said that an expensive fridge was found in the otherwise rundown flat in Dewsbury, on the outskirts of Leeds, where investigators believe the bombs used on July 7 were built, and that the devices were brought to Luton in cooler boxes in the boots of two cars." "The NYPD officials said investigators believe the bombers used a peroxide-based explosive called HMDT, or hexamethylene triperoxide diamine. HMDT can be made using ordinary ingredients like hydrogen peroxide (hair bleach), citric acid (a common food preservative) and heat tablets (sometimes used by the military for cooking)." The numerous reports that carried this story were seemingly unable to even abbreviate the name of the explosive correctly. The actual abbreviation for hexamethylene triperoxide diamine is HMTD. It is interesting how detailed the NYPD had been in their investigations. All the narrative will say about the explosives used in the attacks is that "Expert examination continues but it appears the bombs were homemade". It is somewhat strange that "expert examination" continues almost a year later. What kinds of tests are being done that would take so long to yield results? Again, the narrative uses the terminology "it appears"; yet this informatin would have been established in a matter of days, if not weeks. Despite the narrative being unable to state what kind of explosives were used and how, it is able to state that the "mixtures would have had a strong bleaching effect" and that "both Tanweer and Hussain’s families had noticed that their hair had become lighter over the weeks before the bombing." The families are not on public record as saying this. Tanweer's friends had apparently noticed that he had dyed his hair. However, according to the CCTV footage of just three of the men that was released from their trip to London a week before the bombings, Tanweer’s hair looked extremely dark, and so does Hussain’s in the three images of him released from the July 7th. How, though, can the narrative know the effects of the explosives' manufacturing process without specifcally stating what the explosives used were? "Forensic scientists have told The Times that the construction of the four devices detonated in London was very technically advanced. “You keep hearing that terrorists can easily make a bomb from using instructions on the internet. You can, but not of the design and sophistication of these devices. These were well put together, and it would appear the bomb-maker has highly developed skill,” one expert said." On July 12th, police searched six properties in Leeds. It was reported that they had found "substantial explosives" in a flat in Alexandra Grove, Burley. It had been widely reported that this flat had been let to Lindsay by Dr. Magdi Mahmoud el-Nashar in the weeks before the bombings. "Dr Nashar said he had met Lindsay in Leeds during the Muslim festival of Ramadan in October-November last year. He said Lindsay had asked him in June for help in finding somewhere to live in Leeds so he could move there from London with his wife and child." However, there are no reports that Lindsay lived in London. In fact, it was reported that Lindsay had moved to Aylesbury in the weeks prior to the bombings. "He was a big, powerfully built man, not fat but muscular. He wore the traditional Muslim robes and cap and spoke with a southern or London accent. Magdy told me that he lived in Bradford for a while. I believe they met for the first time in the prayer room at Leeds University. He was studying Arabic, either on an academic or self-help basis, and was very devout." It makes no sense that Lindsay would have had a "southern or London accent" having lived in Yorkshire for almost his entire life. Other descriptions given by people living in neighbouring flats also do not match that of Lindsay. "A newly developed flat in bedsit land, this is where the deadly bombs were made in the bath by a mystery man who arrived from London and "needed somewhere to stay. He is described as being of Mediterranean appearance, about 30 to 35, 6ft 3in tall, with short curly dark hair. He is believed to have left the country on July 6." What is peculiar here is that one of these Mirror reports is referring to Lindsay and the other Mirror report is not. Yet they appear to be describing the same man; both "Mediterranean" and both 6ft 3in tall. Neither of these statements matches the description of Lindsay, who was Jamaican and 19 years old, over a decade away from being in his early to mid thirties. So, who was this 'Mediterranean-looking' stranger who allegedly made the bombs, who would come and go at strange hours? The media seem to have generally assumed that it is Lindsay, ignoring the discrepancy in the physical descriptions of this man. Even if we disregard the odd situation of Lindsay apparently trying to rent a flat in Leeds and a house in Aylesbury for himself and his family at the same time, it is reasonably clear from these descriptions that the man who rented the flat from Dr. Nashar was not Lindsay. In fact, in all the reports, including those of many men coming and going at strange hours, which led police to state that this indicated the existence of a large terrorist network, there are no witnesses who have actually described seeing the suspected men. "The morning of the July the 7th, where I saw 'em all, them getting into the vehicles to go, at that time, to bomb London, and I looked out and there were all these people getting into cars." "And this is on the July the 7th, where I saw 'em all, what I thought were dealing in drugs and it was them, getting into the vehicles to go at that time to bomb London. I saw 'em putting stuff into the boot of cars and I thought they were dealing in drugs - and I know they saw me from the window." "The weekend of the July the 7th that I saw an old Asian lady clearing out some rubbish of number 18 from the other side and putting it into bin bags what were garden sacks what were full of I don't know what from the garden what they've been putting from the garden. I don't know who that lady was and I don't know who took the sacks but the sacks have gone." If we are to look objectively at these statements, we can see that not only does Sylvia Waugh not describe the suspects, but she says she "saw them all", which suggests a large group. This seems odd in the light of there being only three men who allegedly left Leeds that morning, and only in one car, a Nissan Micra, not "cars". The reporter, Emma Murphy, stated that the Metropolitan police had released a statement "in the last hour" of that day, confirming that they had spoken to Sylvia Waugh, that they were treating her as a very credible witness and saying that the information she has provided to them and to ITN news offered them an active line of enquiry. This gives the impression that Sylvia Waugh had only just offered her statement, whereas such testimony should surely have offered an "active line of inquiry" almost a year ago. If the men, as is reported in the Official Report, travelled down from Leeds and reached Luton early on the morning of July 7th, this suggests they would have had to have left Leeds at around 4 to 4.30am. According to a typical journey planner, the journey takes around 2½ hours and at least one stop for petrol, as documented in the narrative, needs to be accounted for. It is not completely unrealistic that a person would have been awake at that time of night and looking out of their bedroom window, but unless it was a very brightly lit area, it does seem unlikely that the people Ms. Waugh says that she saw would have been clearly distinguishable. This would account for the fact that she, and the report, avoids saying that she actually saw Khan, Tanweer and Hussain. When we also take into account that she speaks of "cars" and "all these people" it is not clear that she actually did see these men at all. "Mr Langham said: "I would see three of them coming and going quite a lot." He added: "They didn't seem suspicious but they never really introduced themselves as our new neighbours." Mr. Langham does not say "I would see the three of them coming and going quite a lot", which would indicate he was speaking of the suspects. Again, it is not clear that the men he saw were any of the men accused of bombing London. "Police say they also found several sets of fingerprints at the Leeds location besides those of the four bombers in the first attack." At the very least, there have been several indications that many more people visited the flat than the four suspected men, so it is hard to understand why there have been no further reports or media investigations into this. What is also extremely curious, and has yet to be explained, is how the police were led to the ‘bomb factory’ in the first place. The Home Office report states on page 10, “Further information provides a possible link between Hussain and 18 Alexandra Grove.”, but does not explain what this information was. By early afternoon the following day, police had, with assistance from the army, carried out a controlled explosion to gain entry to the flat, after evacuating over 500 people from their nearby properties and erecting a 100 yard cordon around the property. How did the police know that only Alexandra Grove was the ‘bomb factory’ and required a controlled explosion to gain entry as opposed to any other property they planned to search? The only media report that suggested a link between Hasib Hussain and Alexandra Grove, was in The Mirror who reported the previous key holder to the flat stating that he had received a phone call from Hussain’s brother, Imran, trying to locate his brother through calling numbers on his mobile that Hussain had curiously left behind. This connection is tenuous at best, and certainly doesn’t explain how Hussain was linked to the flat, especially when considering this other report, which stated: “Police know the keys were with bomber Lindsay three weeks before the attacks.” This is an odd thing to state in light of the fact that Lindsay was not identified as the fourth suspect until July 15th. Further, the flat was a Housing Association property, which should have had the keys returned to the organisation before being passed on to someone else. If there is no evidence that Lindsay ever lived in the flat, which is certainly borne out by the fact that police only identified Lindsay after searching his home in Aylesbury and not after the flat in Alexandra Grove, then what was it precisely that led the police to search it at all? Why does the Official Report link Hussain to the flat, disregarding all reports that Lindsay lived there and held the keys? Despite this coincidence, sensationalized by Peter Power himself, he admitted later on that the drill had not completely mirrored the actual events, and had also involved mainline stations as targets. He also expressed surprise that people would be interested in the remarkable comments he made in his interview and also attempted to minimise the similarities between the exercise and the actual attacks. Despite the fact that he had said the exercise involved the bombs going off at ‘precisely’ the railway stations where the attacks had occurred, he later pronounced that in fact only two of the locations had been similar. However, even after downplaying the parallels, he went on to state "the timing and script was nonetheless, a little disconcerting". Terror drills are not unknown in London, but other coincidences may be the involvement of Peter Power in several high profile tragic events before 7/7, such as the Kings Cross fire of 1987 and the Libyan Embassy siege of 1984, and the strong links that he has with the police and the Government. Additionally, Peter Power had previous experience of rehearsing bombs on the Underground. He helped create the BBC's Panorama programme London Under Attack months before July 2005 and in which London fell victim to a terrorist attack underground, followed by the explosion of a land-based vehicle, a situation not entirely dissimilar to his July 7th rehearsal operation and the events of that day. He is a former Detective Inspector in counter-terrorism and is a close associate of Sir Ian Blair, the Metropolitan Police Chief. He was also selected by the Government to write the Best Management Practice Guide on Crisis & Business Continuity Planning & Risk Management. Peter Power also has connections to former New York Mayor, Rudi Giuliani; he served on the Advisory Board to the Canadian Centre for Emergency preparedness(CCEP), alongside the senior Vice President of Giuliani and Partners, Richard Sheirer, who was also Director of the New York Mayor’s office of Emergency Management, overseeing the rescue and recovery operations following the September 11th attacks. Giuliani and partners is a security consultancy and Investment Bank and Mr. Giuliani himself, by another coincidence, happened to be in London for a conference and just yards away from Liverpool Street station when the blast occurred there on the morning of July 7th. Peter Power acts as an independent security consultant to the media examining the impact of terrorism on London. It would not be unrealistic that he would be conducting an anti-terror exercise, but it is strange that it happened to be on the same day, at the same time, and involving the same stations. Peter Power himself admits this, even when attempting to downplay the coincidence. It arouses suspicion when considering the ‘Wargames’ exercises of the morning of September 11th, involving the same scenarios that later occurred. The chances of these situations being simple coincidence appear quite slim. See also the J7 analysis of the 7/7 terror rehearsal. Terrorism experts in the USA reported that they had been told by “intelligence sources” that at least one person had been warned that a terrorist attack was about to take place. The person they referred to was the Israeli Finance Minister, Binyamin Netanyahu, who was due to attend an economic conference in a hotel near Liverpool Street station. "Just before the first blast, Netanyahu got a call from the Israeli Embassy telling him to stay in his hotel room. The hotel is located next to the subway station where the first attack occurred and he did stay put and shortly after that, there was the explosion." The Mossad office in London received advance notice about the attacks, but only six minutes before the first blast. As a result, it was impossible to take any action to prevent the blasts." Other reports even claim that the warning was not received minutes before the attacks, but days before. Netanyahu himself also denied, though, that he had received any such warning, calling the reports "entirely false". Although this report claims that the AP "quickly replaced the story", they never retracted it. (IsraelNN.com) Army Radio quoting unconfirmed reliable sources reported a short time ago that Scotland Yard had intelligence warnings of the attacks a short time before they occurred. The Israeli Embassy in London was notified in advance, resulting in Finance Minister Binyamin Netanyahu remaining in his hotel room rather than make his way to the hotel adjacent to the site of the first explosion, a Liverpool Street train station, where he was to address an economic summit. At present, train and bus service in London have been suspended following the series of attacks. No terrorist organization has claimed responsibility at this time. Israeli officials stress the advanced Scotland Yard warning does not in any way indicate Israel was the target in the series of apparent terror attacks. If there was advance knowledge of the attacks, even if they could not have been prevented, surely it would have been more constructive to have warned TFL Managers and people who could have worked to minimize the resulting confusion – if not the destruction - rather than a politician who was still in his hotel room and would not have been on a tube train that morning? It is perhaps also interesting to note that the conference which Israeli Finance Minister Binyamin Netanyahu was due to attend was organised by an alliance of the Tel Aviv Stock Exchange and Deutsche Bank, the German Financial Services organisation who had become only the second international member of the TASE just one year previously. Perhaps the conference was related to the anniversary of the union between the Tel Aviv Stock Exchange and the German financial services giant on July 6th, the day it was announced London had won the Olympic bid for 2012? TEL-AVIV, Israel --(Business Wire)-- July 6, 2004 -- The Tel-Aviv Stock Exchange announced that Deutsche Securities Israel, a subsidiary of Deutsche Bank AG, has become an exchange member. Membership enables direct access to trading on the exchange. The TASE Board of Directors approved the German bank's membership on July 1. Deutsche Securities Israel becomes the TASE's second international member after UBS, which joined the exchange in 1997. It was first claimed that the four suspects were so-called ‘clean skins’ and thus able to plan and execute the attacks unknown to the police and security services. However, on July 13th, French Interior Minister Nicolas Sarkozy revealed that Charles Clarke had informed him that this was not the case, and that two of the suspects had been arrested in 2004 but released in order to break the wider network. Mr. Clarke vehemently denied that he had told Mr. Sarkozy any such thing. On October 26th, it was revealed that Mohammad Sidique Khan had been under MI5 surveillance in 2004 and shockingly, a few days later it came to light that all four men had been tracked. In February 2006, it was claimed that the NYPD and the FBI had warned British Officials that a Pakistani-American in custody in New York had alleged that he knew Khan and that he was "trouble", even though the informant, Junaid Babar, had already made his claims back in July. There is a very interesting background to Junaid Babar, who had been told he would serve less time under a plea deal, which presumably involved identifying terror suspects. The ISC report into the London Bombings describes Khan as having been "peripheral" to previous surveillance and investigative operations, despite the fact that a lot of time and money was spent on photographing him, tapping his telephone and tracking his car. Transcripts of the taped telephone conversations were never made available to the ISC. "For the ISC report to be more incisive would not have been difficult. It does reveal that there were occasions before the attacks when MI5’s attention was drawn directly or indirectly to Khan but goes to great lengths to play them down. For example, the report notes that in 2003 a known terrorist suspect under investigation by MI5 made calls to a telephone number registered to a “Siddeque Khan". "The 7 July bombers have been identified as Mohammed Siddeque Khan (30), Hasib Hussein (18), Shazad Tanweer (22), and Jermaine Lindsay (19)." The actual spellings are Mohammad Sidique Khan, Hasib Hussain, Shehzad Tanweer and Germaine Lindsay. This makes one wonder how they could have been effectively monitored if such rudimentary details about them are wrong. The Metropolitan Police stated in a press conference that they had found personal documents bearing the names of three of the four suspects close to the seats of three of the four explosions. They also stated that property in the name of Mohammad Sidique Khan was found at both the Edgware Road blast site and the site of the Aldgate blast. Even stranger, according to the narrative, not only had Khan’s property been found at the two blast sites on July 9th, even more of his property was found at the scene of the bus explosion in Tavistock Square on July 14th. Why would Khan’s property have been at sites he was not otherwise forensically linked to? A simple answer would be that the other suspects were carrying his identification along with their own, but a further argument would be why were any of them bothering to carry identification at all? Despite the surprising survival of this documentation, it would generally be unlikely to remain intact during the explosions, since the documents would be at the very epicentre of the blasts. It also seems odd that the men would be carrying incriminating receipts with them on a suicide mission, as The Mail reported. It is completely unclear how the suspects were definitely identified. DNA has been mentioned but it is not stated where the samples were taken from and what they were matched with. What about evidence other than DNA which, once upon a time, would be required in order to secure a conviction for even the most minor offence? Two of the men, Tanweer and Hussain, have reportedly had family funerals and their remains have been interred in Pakistan and Yorkshire respectively. There has been no account stating the whereabouts of Lindsay’s body, and the family of Khan have asked for a second post-mortem to be carried out on his remains, which are apparently in fifty separate packets. "I don’t know whether that was my son. Neither I nor his wife have been able to identify him." The family of Hussain say they have been shown no other evidence than the credit card belonging to him which was found in the bus wreckage. A strange report in The Scotsman stated that Hussain had been easily identified as the perpetrator of the bus bomb because his were the only injuries consistent with wearing explosives strapped to his chest – yet he was apparently carrying the bomb in a rucksack. 12.1. 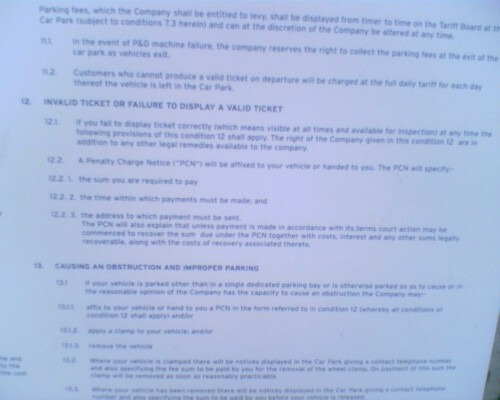 If you fail to display ticket correctly (which means visible at all times and available for inspection) at any time the following provisions of this condition 12 shall apply. The right of the Company given in this condition 12 are in addition to any other legal remedies available to the company. 12.2 3. the address to which payment must be sent. The PCN will also explain that unless payment is made in accordance with its terms court action may be commenced to recover the sum due under the PCN together with costs, interest and any other sums legally recoverable, along with the costs of recovery associated thereto. Click for photo of Luton parking regulations. 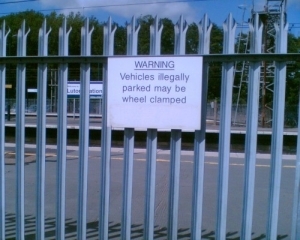 In addition to this, there is a sign which warns that vehicles parked illegally may be wheel clamped. In other words, there is absolutely no mention of the towing away of vehicles as being the penalty for not having a parking ticket visible on a vehicle. This would, in any case, not be a reasonable course of action for any car park to take on the same day a vehicle is discovered unticketed.. In contradiction to the narrative, news reports stated that Lindsay had ticketed his car and it was the DNA he had left on the ticket which had been used to identify his remains. Lindsay’s wife, Samantha Lewthwaite was adamant on July 17th that her husband was innocent and said she would not believe he had been involved in the attacks "until they have his DNA". "The next day [July 14th] they showed me Jamal on CCTV and said his DNA proved he was one of the bombers. My world collapsed"
This, in turn, contradicts a report where the police had stated that DNA identification would "take some time". How could Samantha have been so insistent that she would not believe it without DNA proof, but can later say she was aware that DNA proof already existed three days beforehand? Samantha had asked Lindsay to leave their home on July 6th after finding texts on his phone to another woman. Therefore, she was not immediately concerned that he would have been affected by the bombs on the 7th and did not report him missing until July 13th. Strangely, that very same day the police came and raided their home, even though there is nothing in the narrative to suggest at this point that he was a suspect and apparently no other concerned families reporting loved-ones missing had their homes searched. The police did not find property belonging to Lindsay at the scene of the Piccadilly Line explosion until July 15th. Early reports gave the name of the Piccadilly Line bomber as Ejaz or Eliaz Fiaz, who, like three of the suspects came from Beeston. His brother, Naveed, was detained at Paddington Green after the bombings but was released without charge on July 23rd. He was reported to have handed himself in for questioning voluntarily. Naveed Fiaz had worked alongside Khan in the Iqra bookshop in Beeston and also for the Youth Support Service at Leeds Community School. So there were apparent connections between him and at least one of the suspects, but there is no explanation for why Naveed’s brother, who was known as ‘Jacksy’, was believed to be the ‘fourth bomber’ and his name given by the media with the same amount of confidence of the other suspects’ names. His house was raided along with those of the other suspects and neighbours spoke of how he had taken the apparently unusual step of changing his appearance by bleaching his hair and mentioned other personal details about him. The name originally given for the Edgware Road suspect was Rashid Facha. Bizarrely, ‘Rashid Facha’ lived at the same address as Khan, and his wife’s name was given as Hasina Patel – the same name as Khan’s wife. Neighbours even spoke about him and the work he did, which appeared, yet again to be similar to Khan’s job. "At 7.05am yesterday, police stopped at a neat, modern bungalow in Thornton Park Avenue, in Dewsbury, west Yorkshire, where retired and recently widowed former local high school teacher Farida Patel lives. Within an hour or so, police raided an address at Lees Holm, a cul- de-sac of council houses a five-minute drive away, where Mrs Patel's daughter Hasina, 23, has been living since January with her husband Rashid Facha " in his late 20s and of Pakistani extraction " and their eight-month- old daughter. Police arrived at the couple's house at 8.15am and Mrs Facha was led away in her veil. A neighbour said Mr Facha had been missing since last Thursday." The missing man described in this report was clearly Mohammad Sidique Khan. He lived at the same address and had a wife and mother-in-law of the same name. The neighbours surely knew what his name was, if they knew these other names, so why was he ever referred to as Rashid Facha? And, one might have thought, Rashid Facha most definitely would not have been on the name found on the personal documents belonging to Mohammad Sidique Khan that the government narrative states were found at no less than three of the blast sites. Within hours of the bombings, the media were speculating about possible ‘masterminds’. The first name to be mentioned was that of Mustafa Setmarium Nasar, suspected of orchestrating the Madrid bomb attacks. "Nasar's name has been widely mentioned in reports citing security officials speaking about the investigation into the July 7 bombings, in which 52 people were murdered on the capital's transport system." Another name given a lot of press exposure was Haroon Rashid Aswat, from Batley in West Yorkshire. He had reportedly left Britain “just hours” before the attacks on London and according to the police, had made several mobile calls to the men in the days leading up to the attacks. It is also claimed that Khan phoned Aswat on the morning of July 7th. "Haroon Rashid Aswat was carrying a belt packed with explosives, a British passport and a substantial amount of cash when he was seized, according to intelligence sources in the country." "We have arrested no one with the name of Haroon Rashid," the minister told AFP. "The reports in this regard are untrue. I deny it." It was also strongly denied that anybody at all had been arrested in Pakistan in connection with July 7th. On July 29th, John Loftus, a terrorism expert and former federal prosecutor, appeared on Fox News and revealed that Aswat was an asset of MI6, the British Secret Service. According to Loftus, Aswat had been under the protection of MI6 for many years. What John Loftus was said was later confirmed and thereafter, Aswat’s name was only mentioned in connection with terrorist training camps he was accused of setting up in the USA, for which he was ostensibly arrested in Zambia in late July and deported to Britain on August 7th. "Police have never believed that the four British-born bombers were acting alone and wonder if the mystery Pakistani man was sent to help the group to finalise their plans." "An investigation into the four suicide bombers from the first attacks and the people alleged to be behind the July 21 plot has found no evidence of any al-Qa'ida 'mastermind' or senior organiser. The inquiry involved MI5, MI6, the listening centre at GCHQ and the police. The disclosure that the July 7 team was working in isolation - and were radicalised by Mohammad Sidique Khan, the oldest man - has caused concern among anti-terrorist officers"
The official government narrative states, "The press reported later that a known extremist figure and possible mastermind left the UK shortly before the bombings. There is no evidence that this individual was involved" and rather ambiguously concludes, "The extent of Al Qaida involvement is unclear. Khan and Tanweer may have met Al Qaida figures during visits to Pakistan or Afghanistan. There was contact with someone in Pakistan in the run up to the bombings. Al Qaida’s deputy leader has also claimed responsibility." "It remains unclear whether others in the UK were involved in radicalizing or inciting the group, or in helping them to plan and execute it. But there is no evidence of a fifth bomber"
"There was at the time of the attacks, reports of a "5th bomber". It was thought, because of witness statements and CCTV, that there was a "5th man" with the group travelling down from Luton. Inquiries showed the individual was a regular commuter and he was eliminated from the inquiry. Also in the period immediately following the attacks, one man was arrested in connection with the investigation but he was released without charge. In subsequent weeks, a further man who had claimed to be the "5th bomber" was also arrested and later charged with wasting police time. There is no intelligence to indicate that there was a fifth or further bombers." Discounting the idea of a fifth bomber leaves no explanation for the fifth rucksack that was left in the car, apparently primed and ready for use. The regular commuter that the narrative makes reference to is probably who this Times report mentions, as a man who was picked up by CCTV cameras at Luton standing next to the men. Although according to a Newsday report, the men was not seen with them at Luton, but at Kings Cross, and reports that at the time, police and intelligence sources did consider him a suspect. If there genuinely is "no evidence" to indicate that there was a fifth or further bombers, then all the above reports were completely untrue; and then one has to wonder why such stories, in all their apparent detail, are allowed to mislead the British public. On September 1st, 2005, al-Jazeera, a television station formed from the remains of the BBC Arabic Service broadcast a video of Mohammad Sidique Khan. It is not known why it took so long for this video to be shown. In fact it is not known how or where the video was made – or even if it actually is Khan. Many of his friends don't believe it is him and others admit he looked ‘significantly different’ in the video. The video showed Khan making no direct reference to London or any intentions he had of organising an attack on it. In fact, if viewed objectively, his speech was incredibly ambiguous. The video was edited to include footage of Ayman al-Zawahri, presumably to give credence to the theory that al-Qa’ida organised the London bombings and the Khan was a ‘foot soldier’. However, the media later began dropping the idea that the attacks had been organised by anyone other than the four accused men themselves, despite Jack Straw’s pronouncement that what happened in London "Bore all the hallmarks" of the al-Qa’ida network. There has been no explanation as to who edited the tape, how it was obtained by al-Jazeera or why it incorporated the al-Sahab logo, a signature of al-Qa'ida videos. "I find it a little bit depressing that people don't realise this is al-Qaida's calling card. It shows how little some understand about al-Qaida." "The style is that of al Qaeda -- multiple attacks in different geographical locations to inflict maximum casualties. Only al Qaeda has the ability to carry out successive attacks with such coordination, we have no doubt it was al Qaeda, not only because of the planning of the attacks but because of their political timing. Al Qaeda always times its attacks with major political events. This is its strategy." Yet is has now become widely accepted, and confirmed by the narrative, that the video can have had nothing to do at all with al-Qa’ida, and that the men acted alone. The narrative referred to the video and also mentioned a separate last Will and Testament where Khan had indicated his intention to martyr himself through a terrorist attack. However, this Will has never been previously mentioned and certainly never shown. There were a few strange reports in the days after July 7th describing a shooting at Canary Wharf the same day of the attacks. "POLICE were yesterday probing reports a man had been "neutralised" outside Canary Wharf. It is believed the man was shot dead by police marksmen outside the Credit Suisse First Boston bank." The first report was from a Reuters employee who stated that it was two men who had been shot, and that it had happened outside the HSBC building. "The New Zealander, who did not want to be named, said the killing of the two men wearing bombs happened at 10.30am on Thursday (London time). Following the shooting, the 8000 workers in the 44-storey tower were told to stay away from windows and remain in the building for at least six hours, the New Zealand man said." It is strange that these reports were never followed up. The above report came from a New Zealand newspaper and the story was also picked up by Canadian media, but there was barely a mention of it in British media, even to rubbish the story. It was obviously a day of confusion, but if an incident like this was witnessed by the amount of people suggested in the report, this does not suggest that what happened could have been mistaken. One witness reported seeing a "saw a flurry of police cars and yellow-vested men" outside the HSBC building. At a press conference on July 7th, the police were asked to elaborate on the reports, but they simply said there had been no such incident, with no apparent explanation for why there should have been a "flurry" of police activity at Canary Wharf. QUESTION: Can you tell me -- the rumors that a police sniper shot dead a suicide bomber at Canary Wharf (ph). Do you know anything about that? PADDICK: We have no reports of any police sniper shooting at anybody today. Another odd report from that day which, perhaps understandably, has had no press coverage is that Managers at Kings Cross station were all asked to come to work early, at 7am, which they had rarely, if ever been asked to do before. Before the explosions occurred, the Managers were told on no account to speak to the press that day. Such reports should not be dismissed on the basis that they come from unnamed sources and did not reach mainstream coverage. An inordinate amount of press coverage regarding the attacks of July 7th involved information from ‘sources’ which were not named, yet are judged to be authentic in that capacity. Such reports should surely be investigated, even if only to discover that they had no basis in truth, rather than simply ignored by the media.